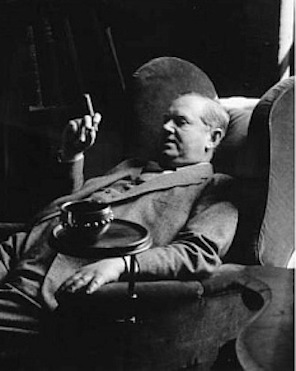 Evelyn Waugh finished Helena in March 1950. He began Men at Arms in June 1951. His state of mind in the fifteen months in between was rather strange, I've come to realise. What do I mean by 'strange'? You'll soon see. He wasn't keeping a diary at the time, so the fifteen-month period is not known about in detail. But there are letters and biographies. So we know that he read many books, and had a few guests staying with him for short periods at Piers Court. In addition, Evelyn took four holidays abroad. In April 1950, he went to Italy via Paris, and stayed with Harold Acton, amongst others. In July, he went to Holland to deliver lectures to audiences in The Hague and Amsterdam. In October, he went to New York for a fortnight with Laura to see the few friends they'd made from earlier trips across the Atlantic. And in January to March of 1951, he was travelling through Israel, Jordan, Syria and Turkey with fellow Roman Catholic, Christopher Sykes. That is a bleak picture and I think a fair one. But it needs further investigation. It needs layering. Fifteen months is a long time for an established writer not to be writing about anything apart from the odd review. In summer he wrote to his literary agent: 'I keep squeezing the old lemon for a short story, but not a drop comes.' Waugh did manage to write something ambitious in September of 1950, a short story called 'A Pilgrim's Progress'. It was rejected in no uncertain terms by a couple of editors at the time. 'It seems to me sad that this man's talent should be wasted on such a story,' said one. 'The theme is almost implausibly apt for satire by Waugh, and yet his handling of it is, for the most part, dull-witted and tedious,' said another. Criticism, indeed. Waugh soon withdrew 'A Pilgrim's Progress' from circulation. As we'll see, he kept working on it, turning it into the novella Love Among the Ruins, which was published as a book in itself in 1953. I'll talk about the published work in part two of this essay. But here I want to focus on the unpublished first draft since, damp squib though it may have been, it reveals Waugh's strange (that word again) state of mind between two accomplished and successful works, the religious Helena and the backward-looking and diary-based Men At Arms. I haven't got free access to the manuscript of 'A Pilgrim's Progress', which is in the Harry Ransom Centre at the University of Texas, along with most of Waugh's manuscripts and the books from his personal library. But Robert Murray Davis has seen it, and describes it in some detail in chapter 14 of his 1989 book, Evelyn Waugh and the Forms of His Time. So I'll be quoting from that, and from Waugh's letters that are included in The Letters of Evelyn Waugh, to show that, as usual (Helena being a noticeable exception), this piece of Evelyn Waugh fiction is strongly autobiographical. Though, on the face of it, the book's protagonist, Miles Plastic, a twenty-year-old man who was invented to show what Waugh thought of the Modern Age and the Welfare State, was surely intended to be anything but. Beyond sane endurance? Not much fun then. Country house as prison? Twice in January of 1950, Waugh, living in Piers Court, wrote to a close correspondent about the (not entirely serious) possibility of having to go to prison. What does he mean by this sentence, which brings Martin Stannard's description of Waugh's cinema and crossword existence to mind? It connects to the previous quotes about taxation and prison. To pay for the post-war Welfare State, rates of personal taxation were very high. A large proportion of the income Waugh made from his writing had to be handed over to the government as income tax. This seriously demotivated Evelyn, and he refused to go along with it. Result: sloth, bitterness, indignation. But by September of 1950 he couldn't resist putting pen to paper and drafting 'A Pilgrim's Progress'. So let's get back to that. The words 'taxed' and 'authorship' jump out at me. I can't help thinking that Mountjoy Castle is effectively Piers Court rather than Malfrey. The one-legged V.C. that gets evicted is one version of Evelyn Waugh - the war hero - and he's replaced by another - the arsonist. In any case, we have our first fire. So let's mark it with appropriate imagery. "A position has been found for you in our neighbouring town. You will be janitor at the Euthanasia Ward." "You are now an integral part of Welfare", said the Minister. "We have put your foot on the bottom rung of the ladder. It is there for you to climb, not competitively of course but by natural (Service) stages. In a year or two you may move up to Voluntary Sterilization, perhaps even to Compulsory Sterilization, a department which demands the highest qualities of Service. Who knows one day you may even become Minister. Ha, ha." "Ha, ha, ha ha", said the Governor. 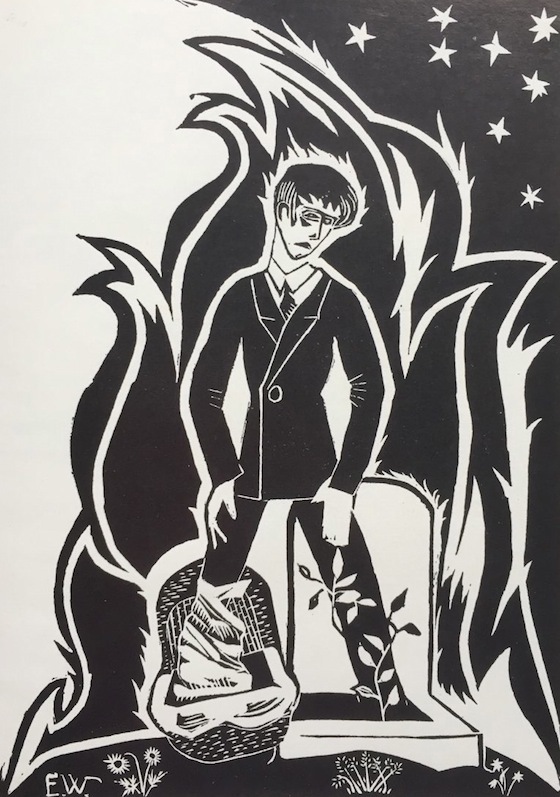 Miles spends a month at the Health Centre in an unnamed city, meets a girl whose red flame-like beard is the result of Voluntary Sterilization, and, rendered inactive by a strike, walks to Mountjoy, burns it to the ground, and returns refreshed to the Centre. Love flourishes between Miles and the whiskered Pamela, partly because her red beard reminds him of flames. Good job Waugh added: 'Didn't you know' to his penultimate sentence. Otherwise one might think he was being serious. Don't you know? This is a little perverse. Miles Plastic was to lecture about the success of the Welfare State, something the protagonist and the author did not believe in. However, Evelyn's miserable experience was while lecturing on something he really did believe in - Roman Catholicism. The reason that Evelyn may have found this story so difficult to write at length, or with a light touch, was that he was drawing on his own experience, fine, but then using it to put over an ideological point. Some such disconnect seems to have disturbed the fictional flow. Picture Evelyn at the end of a lecture, sitting in the 'Bevan City Hostel' on the outskirts of Grayshott/Middlesborough/Leicester, visibly aged by his latest lecturing experience, itching to set fire to himself, his immediate surroundings, the whole unsatisfactory world. That's what Evelyn might have written about if he'd stuck to the methods that had been so successful for him in his earlier fiction. A Monday of despair. Evelyn presses the catch and instantly, temptingly, tantalisingly, there bursts out a tiny flame. How does 'A Pilgrim's Progress' end, if I've not given that away already? The scene shifts to the Ministry, where officials are attempting to deal with the loss of Miss Flower, the more serious question of replacing the model, and the still more detrimental association in the public mind of Mountjoy and fire. Their solution to the last problem is to ship Miles Plastic to America, 'where he is last seen entrained in the Midwest, passing numerous wooden houses, awaiting a full moon, and bearing a box of matches'. So maybe Evelyn didn't set fire to anything when he was in America because he had Laura by his side. A few more general points about the first draft of the story, and Waugh in 1950, before we see where Evelyn took the story prior to its publication in 1953. 1) Waugh gives us Miles Plastic's private - indeed psychotic - response to the conditions which the State has created. But they resemble Waugh's own near-psychotic response to his own life, which he experiences as barely tolerable tedium. He may sometimes think it's the fault of the Welfare State and its system of taxation, but clearly the malaise lies closer to home. One would have thought that Waugh's upbringing - via a tolerant household, a relatively enlightened public school and wonderful Oxford - would have been a route to fulfilment and happiness. But apparently not. 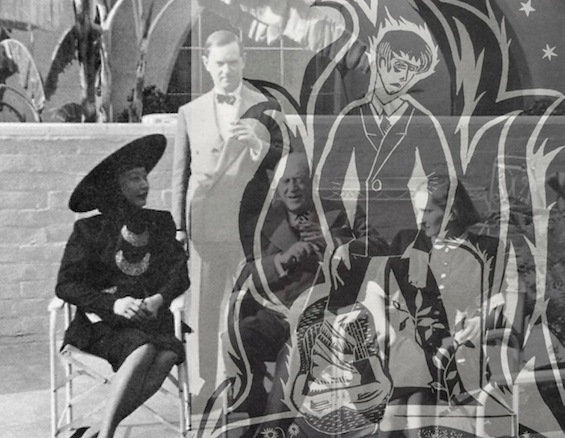 2) MIles Plastic was given an education which featured 'halls adorned with Picassos', long periods of 'Constructive Play' and he never lacked the 'requisite cubic feet of air'. His diet was balanced and on the first Friday of every month he was 'psychonalysed'. Yet, as Robert Murray Davis points out, the conditioning fails. Evelyn Waugh was given an education which featured the gleaming spires of Oxford, the requisite number of drinking buddies, a range of lovers, and a fairly easy entrée into one of the most sought after and exclusive professions. Yet his conditioning failed too. At least that's what one would conclude from reading the angsty bits of his 1950 diary. In the story, as RMD puts it: 'Programmed Dulness has reduced politics, art, private life, even dress to grey and spiritless flatness'. But why was Evelyn apparently the victim of grey and spiritless flatness? He had been raised pre-Welfare, and even in the very year in question had enjoyed access to the fruits of Renaissance Europe, the classical Middle East and fashionable New York. Centuries of civilisation in the palm of his hand. Yet all Evelyn could do was vegetate in between luxury trips. 3) George Orwell needs to be mentioned. As we've seen here, Nineteen Eighty-Four was in part a response to Waugh's Brideshead Reviisted, both featuring female protagonist's called Julia. Waugh met Orwell once (or twice) in 1949, shortly after the publication of Nineteen Eighty-Four, which Waugh had written a letter of appreciation about. Orwell died in February 1950 and it seems quite reasonable to suggest that Waugh wanted to respond to his death and/or his literary legacy. Winston Smith works in The Ministry of Truth rewriting history books to conform to the state's ever-changing version of truth. Miles Plastic is given a job in Euthanasia in the MInistry of Welfare. Miles Plastic, despite his name, is not as bendable as Winston Smith. His Julia (called Pamela in the draft, Clara in the published story) is taken away from him by the equivalent of Big Brother and his response is to strike back. The trouble is, Waugh was not able to invest his vision with the necessary energy and invention. Why not? Well, the drinking binges must have taken it out of him, for a start. But, as I said earlier, he seems to have been intent on taking aspects of his experience and twisting them in order to make the political points he wanted to. Which does not encourage flow. Or was it something else that sunk his story? It seems that I need to go over it again from another angle. 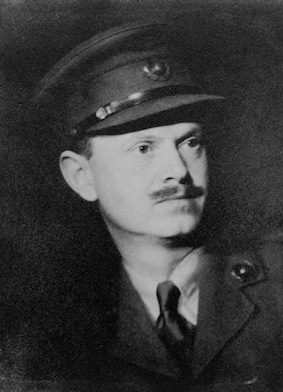 Communications with A.D. Peters, his literary agent, reveal that Waugh revisited 'A Pilgrim's Progress' several times. 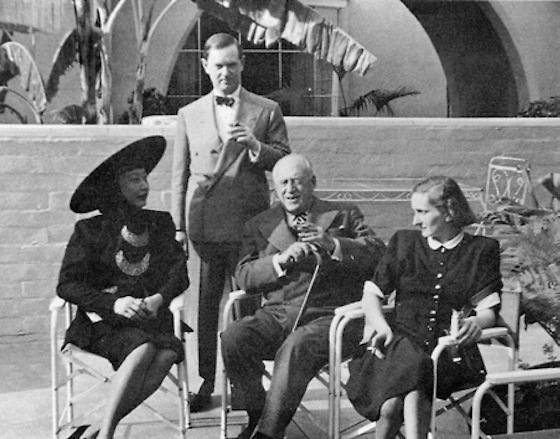 Before leaving for New York on October 7, 1950, Waugh said it's beginning was better than its end. From New York he wrote saying that a final version would be twice as long as the one they were trying to sell. Back from New York in November, he reported that he was revising the story and much expanding it. In March 1951, he promised to work on the story ‘about the youth in the Euthanasia trade’. And then in November 1952, he sent three typed copies of a 9,000 word story 'Love Among the Ruins’, which was the final version of the old story. He suggested it was improved though not flawless, but that he could do nothing more with it. Although I can't be sure whether the aspects of the final story I'm about to discuss were written in autumn 1950, spring 1951 or autumn 1952, I'm placing the discussion here as it relates to what happened to its author in summer 1950. That's when Evelyn and Laura had their seventh and last child, Septimus. Brief resumé: during April of that year, as I say above, Waugh went abroad to France and Italy, leaving Laura at home. She was seven months pregnant by then. He returned to England in late May. Laura soon disappeared to Pixton for her confinement. According to Martin Stannard, Waugh 'settled into a period of depression among servants and younger children, correcting the proofs of Helena'. Septimus was born on 9 July. A week later, Waugh finally went to Pixton and stayed for two days before returning to London for a party. 'I did love seeing you. Do come back, I miss you sorely', wrote Laura. Then Laura wrote again to Evelyn clarifying that she did want to see him but suggesting that perhaps it wouldn't be such a good idea if her brother Auberon was going to be there. 'The mixture of all the children and him would be intolerable to you'. Laura asked Evelyn to write and describe all his parties. It's not that easy to decode what was going on between them. 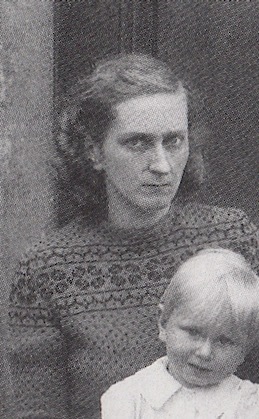 Clearly, Evelyn did not like the idea of being with his wife during childbirth. Indeed, he was not present at the birth of any of their children. Just as clearly, he did not get on with Laura's young brother, Auberon, who lived at Pixton. In fact, they had always detested each other, Auberon having begged Laura not to marry Evelyn. Less clearly, the letters that Evelyn wrote are intended to be loving, supportive and to make Laura smile. Though I don't suppose they always hit the spot. OK, now let's switch to Clara and Miles, always bearing Evelyn and Laura in mind. The formers' story in Love Among the Ruins is so clunkingly plotted that several of the following paragraphs end with caveats. In 1934/35, when Evelyn was getting to know Laura, she was studying drama at RADA. It was at this stage in her life that Waugh wooed her, when she was 18 and he 31. In the end, she chose marriage to Evelyn over any career in acting. This is the opposite to what happens in Love Among the Ruins. Clara knows she won't be able to dance anything like as well after having a child. So she agrees to be sterilised. She chooses her own art over a family life. It's at this point in the final version of the story that Miles goes off to Mountjoy and burns down his old home, the pleasant prison. After which he returns to her bedroom. She says touchingly, "I was half-afraid you wouldn't come. You seemed cross yesterday." He's still cross. He's only there to watch the report of the fire on her television. And when he's watched that, he leaves her for good with the chilling words: "That's all I came for." On the face of it, Miles treats Clara as oddly - or badly - as Evelyn treated Laura. On the face of it, Evelyn behaves as destructively in the aftermath of visiting Laura as Miles does. Here are details from the letter Waugh wrote from Piers Court on July 26, having been to Pixton for a couple of days and having returned from there to London for more of the party season. Good start, Evelyn. Keep it up. Laura had just given birth to Septimus, their seventh child. There were five others still 'below the age of reason', some of them to be found at Piers Court. One would swear that Evelyn was getting ready to admit he had set fire once again to his parents' house at Highgate. In fact he reported being 'not at all nice to my poor mama and left with the first beginnings of bad conscience and melancholy'. Thereafter, Evelyn shopped for an admiral's uniform, went to a cocktail party hosted by Graham Greene where he was beastly to a priest... went to a dinner party hosted by the Duke of Westminster's wife... then onto Debo's nautical party... then onto Ann Rothermere's rival party at 5am for breakfast... and the 36-hour binge was well underway. And after the binge-blaze? A sad, lonely Saturday, a sadder lonelier Sunday. A Monday of despair. 'Harriet and James were not able to give avery coherent account of your condition. They seemed obsessed by the fact that Septimus enjoyed his bath. I miss you unendurably and go whistling about the house and fields never hearing an answer. My health is a little, well much, better. Yesterday I read Put Out More Flags and thought it very amusing. So what was Evelyn saying? That his intense summer of 1950 led to Love Among the Ruins? That Clara's pregnancy owed something to Laura's? That Evelyn was the proud father of his books as well as his children? That even in the midst of life we are in death? 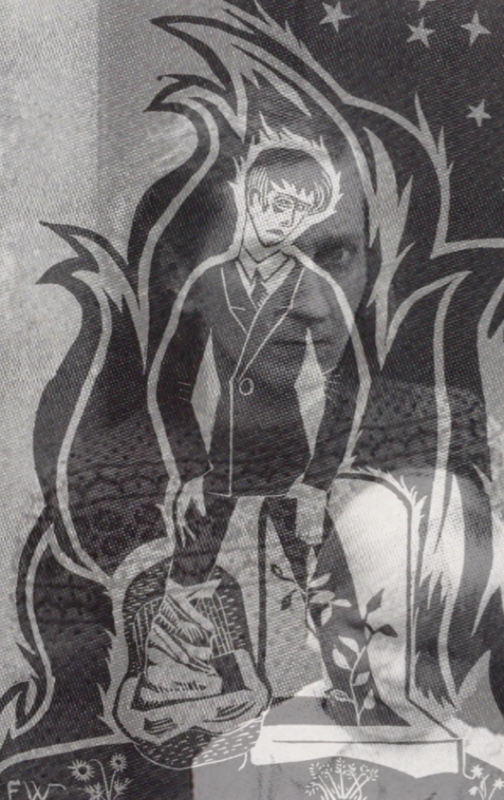 That all summer he had been on fire and it was bloody well killing him? That birth and death, he and she, were as one, and that he was BURNING, BURNING, BURNING? Please note the beard on Whiskers. I don't want my limited Photoshop skills to go entirely unremarked. 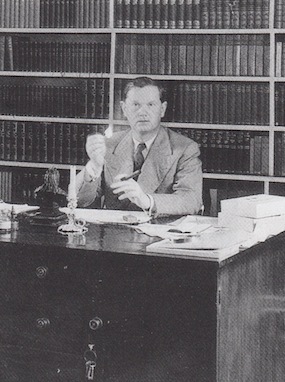 Evelyn Waugh finished Helena in March 1950. He began Men at Arms in June 1951. His state of mind in the fifteen months in between was rather strange, as I've tried to suggest. Have I proven my case? You tell me. 1) This essay owes a debt to Martin Stannard, for his description of Waugh's 1950 in Evelyn Waugh: No Abiding City. 2) And an even bigger debt to Robert Murray Davis for his essay on Love Among the Ruins in Evelyn Waugh and the Forms of His Time. 3) Thanks also to Jeffrey Manley for reminding me about the existence of 'A PIlgrim's Progress'.